What a great concept! 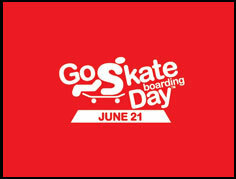 June 21st the first official day of summer has also become the International GO SKATEBOARDING DAY. It just the perfect excuss to make plans to go out and skateboard. Plain and Simple, GO SKATE!!! Visit www.goskateboardingday.org for more info.